Can you set it on a table to raise the controls? The brew day went really well, I like having everything contained in one unit. It held mash temps well, I will have to make a jacket for it though. Had a few degrees difference from top to bottom. I like the false bottom screen that it comes with, kept a lot of stuff out of the pump. Only thing I would like to have had would have been a temp controller that wasn't close to the floor. I'm 6'5", so it's a pain adjusting temps. But all in all I'm glad I purchased it. What was your mash efficiency? Did you need rice hulls? Going off of beersmith, my mash efficiency was 73%, I was using a 14lb grain bill and there was plenty of room. And I didn't have any need for rice hulls. My mash ph was at 5.2. 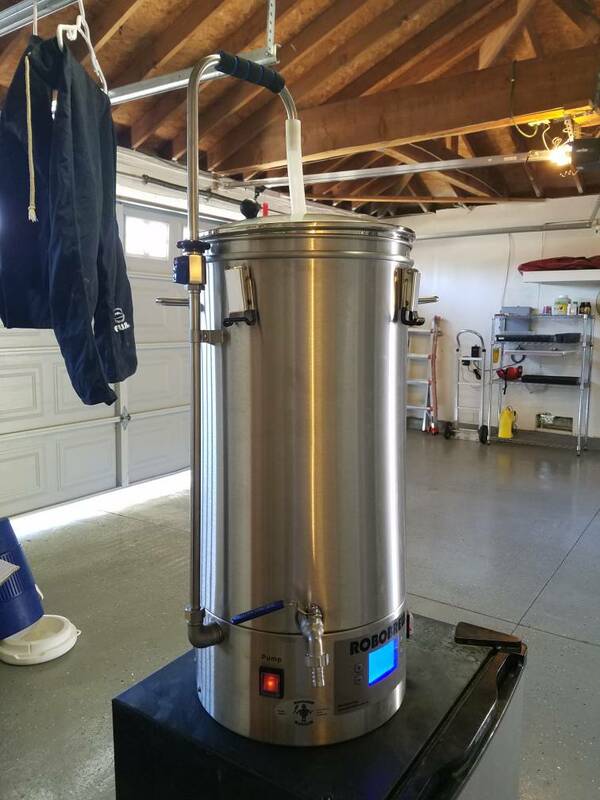 Alot of reviews said rice hulls were a must, mash temp was low during recirculation and even some said there were slight problems with the finished work. 1500 watts enough to boil? Pretty cool man. The controller on the floor is a bit wonky and I think they missed he mark in not allowing step programming. Price is solid. Oh. I was under the impression that you could step mash. What a bummer. I recently watched some of The Beerery videos, it was cool to see the wort change from cloudy to crystal clear during the steps. I didn't have any issues with temps and sparging went fine. My hydrometer readings were not far off. And I had no issues with the boil, I'm just going to make a reflectix jacket just to bring temps up quicker. I also didn't mind having to change the temp manually to step mash. so no big deal for me there. You can still step mash, just not automated. I think I'll wait til Xmas and get one on sale. Until then I'll sharpen my skills. I'm okay with that. I wonder how many degrees per minute. I wish I would have timed it. but as I remember it didn't take long to step up. I didn't wait, I got one last Thursday and brewed Saturday.